Low km, accident, smoke free, and pet free! 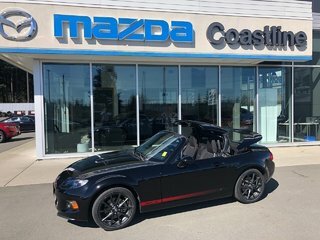 It is not very often a car like this comes along that has only been summer driven, has super low km's, and is as clean as this 2013 MX-5. 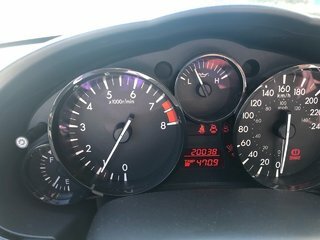 The previous owners traded this 2013 in for a 2019 model as they wanted more power and the Soul Red Crystal Metallic paint. This GS model has the smooth shifting 6 speed manual transmission, 17" alloys, and a power retractable hard top. This hard top is the fastest on the market opening or closing in under 12 seconds, so if a sudden rainstorm hits you will be sure to not get wet. As with every pre owned vehicle for sale at Coastline Mazda this car has been fully safety inspected where only an oil change was needed, has been fully detailed, and comes with a Carproof report for your peace of mind. Financing is available for this car as well. 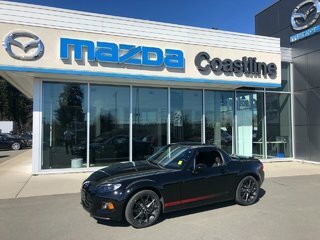 Coastline Mazda serves Courtenay, Comox, Port Hardy, Nanaimo, Victoria, Qualicum Beach, Parksville, and all areas in between. Call or stop in today to look at this beautiful vehicle soon as it won't be here long. 2.0L DOHC MPFI 16-valve I4 engine w/variable valve - 4 cyl. 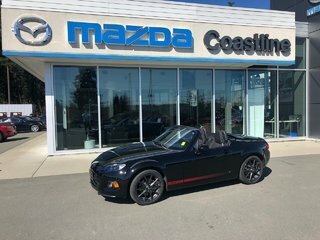 Interested by the 2013 Mazda MX-5 GS ?